I’ve not written a celebration post in a few weeks. that honors the good and needs to be done. points of light are essential. The practice of celebration is a one way to find shimmers of hope. and thank you, Ruth Ayers, @ Discover Play Build for hosting weekly celebrations. The tree outside my classroom has been shedding red five-point leaves. They fall and land on the walkway. 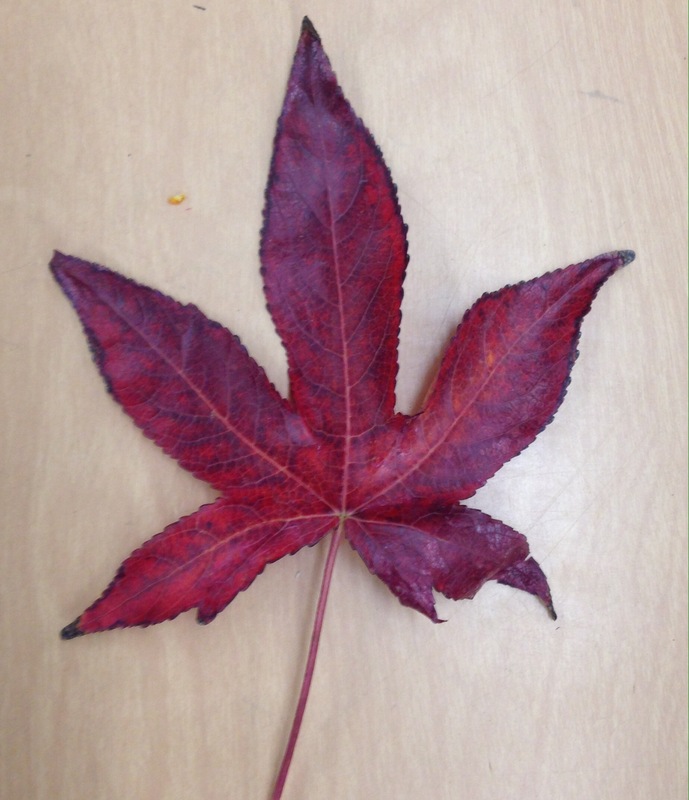 This week two separate times, two different girls rescued a perfect red leaf and gave it to me as we walked to lunch. The first I put on my desk. It dried and folded. When I touched it, it crumbled. The second I preserve here. This week I celebrate the small gifts that touch our hearts. 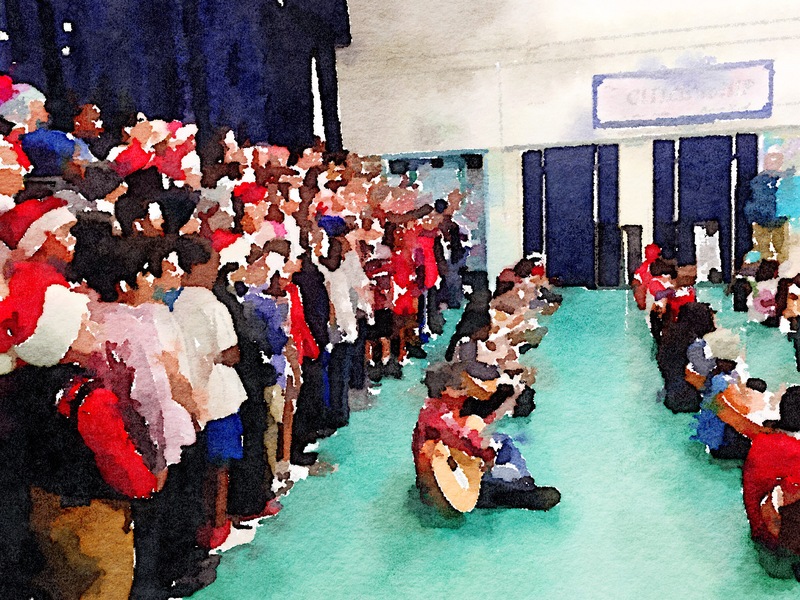 Every year out school celebrates winter holidays with a concert. When I got to school on Thursday, the line for the 8:20 performance wound down the street. Every performance (there were four) was packed with parents, grandparents, siblings and recording devices. No one left early. Kids sang their hearts out. Played guitars. Shook shakers. Danced. Teachers guided. Prompted. And we all smiled. Students were beautiful. This week I celebrate the joy in song and the love it brings out in us all. On Friday, Trevor* handed me a card and said, “There was a white envelope that went with this. There was a Barnes and Noble gift card. It was for you, but I can’t find it. If you find it, it’s from me. I thought maybe because you like books, you might buy one for yourself. Or one you could read to the class.” I told him I’m sure it will turn up. This week I celebrate that my students know I love books and they want to be read to. My students and I spent our last day of 2016 together shopping for books. I handed them new book baggies with glittery pens. Each went off and found three. One for each week. A little bit of the classroom to take with them. This week I celebrate the gift of books. At the end of November, the brilliant Mary Lee Hahn started a daily haiku challenge. A haiku a day for healing. This week I celebrate the power of these small doses of poetry and all who share this daily meditation. Find your daily dose on Twitter at #haikuforhealing. You post makes me merry this COLD Sunday morning. Hooray for celebrations. What a wonderful celebration! That leaf, the gifts of children, your shared loved of reading, and the daily haiku harmony resonating. Thanks. When we meet dark days, points of light are essential – love this! And you have celebrated those points of light through books, gifts, songs and nature! 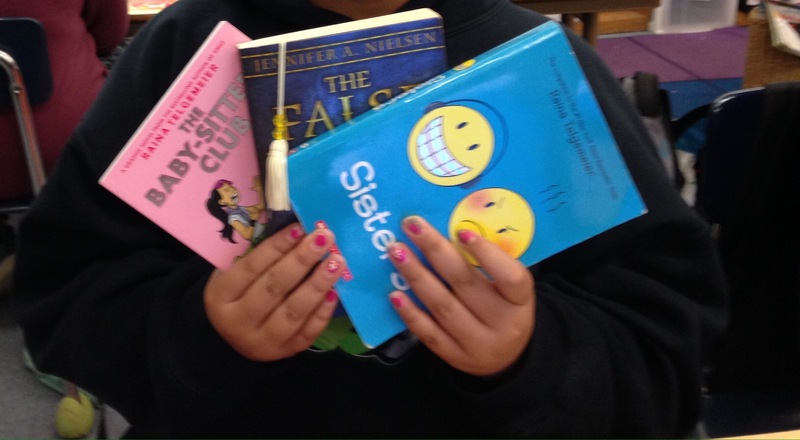 I LOVE Trevor and his story….book love keeps giving! I love that you realize in darker moments that there are glimmers of celebrations. There is nothing than a holiday performance in an elementary school. Well, I love each part, but the sweetness of those student gifts, the leaf and the book card is something for good feelings that don’t disappear. Happy Holidays, Julieanne. Delightful celebration – from the red leaf to the student concerts to the bags of books for the holidays. And students who get that books are the best ever gift for a teacher! Here’s to a restful holiday with much time for reading. The #haikuforhealing sounds like a wonderful challenge. You have much to celebrate. I think celebrating is also a healing ritual.